Information gathered from Sinoe County by the FOCUS suggests that forest rangers of the Forestry Development Authority (FDA) assigned in Sinoe County last Thursday confiscated four bags of dry bush meat during their regular forest patrol. 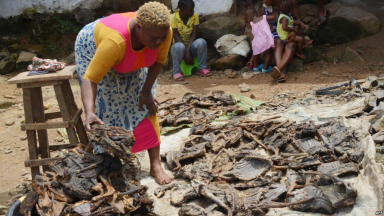 According to our corresponding in Greenville, Lt. Othello Doe, the consignment of dry bush meat was reportedly auctioned by the FDA’s forest rangers in the market in Greenville. Lt. Doe who worked for the North Star Guard Service said on his way to his routine patrol he met the FDA pickup on the road near Wiah’s Town with the confiscated bush meat on board the pickup. He said when inquired, he was told that the two bush meat sellers came from surrounding nearby Kabadee and when they reached Chibio Town they boarded a motorcycle to go to Greenville to sell. Lt. Doe said unfortunately for women the motorbike in which they were riding broke down near Wiah’s Town and while the women were awaiting either a vehicle or another motorcycle to continue their journey, Lt. Doe said, they saw a pickup coming towards them and it was the pickup of FDA’s rangers coming from Jeadepo Forest on their regular patrol. They (women-dealers of the dry meat) immediately stopped the pickup only to know that it was FDA’s forest rangers. He said after putting the consignment in the pickup and later noticed that the pickup was that of FDA’s forest rangers, the two ladies quickly jumped in the bushes and escaped the scene. Lt. Doe said he followed the FDA rangers’ pickup to Greenville. He said when he met the rangers in Greenville and quizzed the head of the rangers; Thomas Nugbah told him that they were auctioning the bush meat to deposit the proceeds from the auction into government’s revenue through the offices of the Liberia Revenue Authority, LRA. He did not say how much was actually generated from the auction of the bush meat but said the rangers were still carrying on the transaction when he left the scene. It is always a tradition of the FDA to patrol in the forest regions and its environs to protect the wildlife within the forest and most especially the area where the women were coming from with the bush meat is in the direction of the Jeadepo Forest which is close to the Sapo National Park.